The use of pillows filled with spelled chaff is not new. For centuries people have been sleeping here and in the middle of Europe on a spelled pitcher. We found the spelled in the haystack! 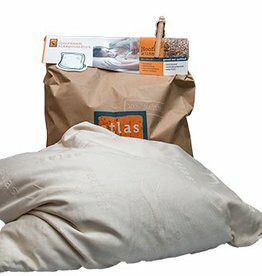 Mother Earth is our main supplier for making our pillows: the pillow consists of 100% unbleached cotton and the filling consists of selected and purified spelled chaff. Everyone benefits from a healthy sleeping position. Our spelled chaff pillow has the unique property that it adapts to the shape of the body. The specific structure of the chaff particles ensure that the head and neck are effectively supported, even when you move. In times of tension and stress, the spelled pitch pillow can bring you relief and contribute to a relaxing night's sleep.